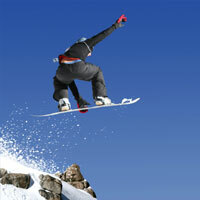 Big Bear can boast of two of Southern California’s largest ski resorts. Bear Mountain and Snow Summit. Bear Mountain in Big Bear Lake CA is the larger, covers 198 acres of developed and with hundreds more acres of patrolled natural terrain where you may ski at your own risk. Mountains include Bear Peak (8805 ft), Silver Mountain (8560 ft), Goldmine Mountain (8440 ft.), the original name of the ski area, and Showdown Mountain (8000 ft) with access from 2 high speed quad chairs as well as a variety of other lifts. There is a wide variety of terrain available, and for some reason, snowboarders tend to favor this ski resort more than Snow Summit. True to its name, Geronimo is the most daring slope for advanced skiers. But don’t let that scare you off: there are great options for every level of ability. The operators are particularly proud of their The freestyle park which was named #1 Park in the Nation by Transworld Snowboarding Magazine's 2009 Resort Poll. THE PARK has 150 jumps, more than 80 jibs, Southern California's only Superpipe, one standard halfpipe and plenty of other totally unique features. Maybe this is why it is so popular among riders. There are night skiing opportunities during the season, and the managers start making snow as early as September for special events like 6th Annual Hot Dawgz and Hand Rails "Rise of the Dog"!. Thanks to an annual snowfall of 100 inches, you can experience a lengthy natural season extended by. Bear Mountain also produces live web cams so you can really see some action. Lift ticket rates run around $60 dollars for adults, $50 for teens, and $20 for kids, and your lift passes are good at either Bear or Snow Summit. If you ski Bear Mountain often, you may want to check out the City Concierge Bear Mountain discount lift tickets. During non-peak times we get some good specials. Come on up and join us in the snow.